Go West, and see the wild. Well, maybe not quite from the train as you pass by, but something to look for when you go hunting out there. 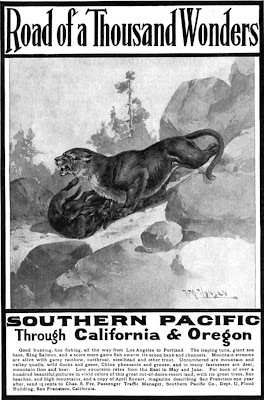 Artwork by H. W. Hansen; ran in the May 1907 issue of the CENTURY MAGAZINE. This ad for travel on the Southern Pacific Railway, through Oregon and California, is from the eBay catalog listings of seller americanartarchives .